Glacier National Park, often called the “Crown Jewel” of the National Park System, is tucked away in northwestern Montana right up against the Canadian border. It is a spectacular mass of high mountains, green treed valleys and crystal clear glacial streams. Everywhere you look is like a picture postcard and the Park is chock-full of wildlife. I was on a trail originating near the Many Glacier area of the Park about half way up the mountain looking for bears to photograph when I spotted this guy happily munching on tender succulents. 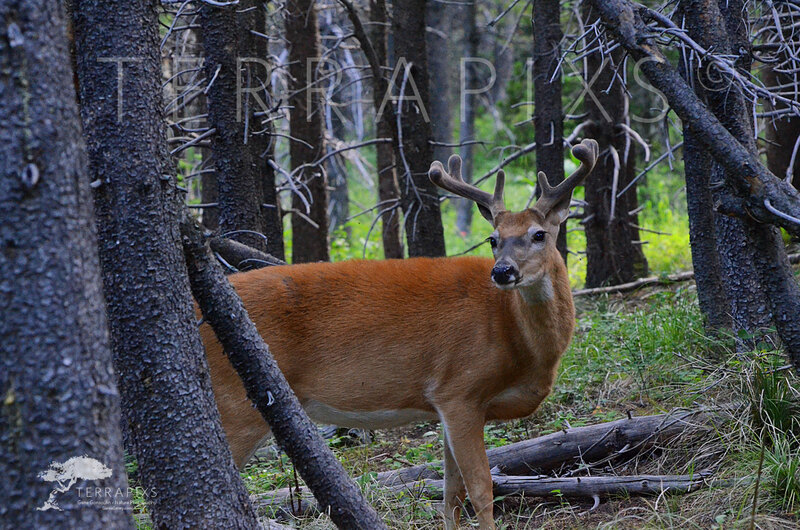 He is a Mule deer (Odeocoileus hemionus),differing some from the eastern White-tailed deer (Odocoileus virginianus). The Mule deer has a black tipped tail, the White-tailed deer’s tail is tipped in white. Perhaps the most notable difference are the size of the ears and the antlers (as opposed to “horns”). The ears of the Mule deer are considerably larger, hence the name “Mule deer”, and the antler prongs are bifurcated, or forked, towards the ends as they grow. The White-tailed deer conversely has comparatively smaller ears and their antlers have straight prongs. While in recent years the White-tailed deer has migrated into the western states somewhat, the predominant deer seen out west is still the Mule deer. So, what are antlers (vs “horns”). Antlers are found on the heads of male members of the deer family (with the exception of Reindeer, where the females also have antlers). They are made of bone and sprout from a bony type of growth at the top of the animals skull. This generally occurs in spring and the new antlers are covered with a fuzzy looking type of growth called “velvet”. It is heavily laced with blood vessels to feed the growing antlers. Once the antlers have reached the full growth extent for the age of the animal, the velvet drys up and is shed by rubbing the antlers on small trees/shrubs. Antlers are shed in the winter (regulated by day length) after rutting (mating) season. Think of deer, moose, elk,.all of which have antlers. Horns on the other hand consist of an interior of bone as an extension of the skull covered by a keratin like material and are more permanent, growing constantly throughout the life of the animal. Think of goats, sheep, Rhinoceros, and the like. Mule deer, as do White-tail deer, usually have one offspring per year, but sometimes do have twins. In warmer climates, females may mate more than once and subsequently have two families per year. For the most part, a deer will live only 5-7 years and many young do not make it to adulthood due to heavy natural predation. Its a tough world out there! Deer will generally be active early or late in the day. So, be on the lookout and enjoy their beauty.